It may have given up some ground over the years to a host of ever-improving rivals, both foreign and domestic, but Dodge‘s Caravan and long-wheelbase Grand Caravan are still the 800-pound gorillas of the minivan world. They, and their upmarket cousin, the Chrysler Town & Country, are the highly evolved results of 20-plus years of family-hauling mastery from the company that coined the term “minivan.” And though they’re a bit long in the tooth on the mechanical side, their interiors are still near the top of their class, as little has escaped the consideration of the Chrysler engineering team in its obsessive quest for supreme space-efficiency, user-friendliness, and occupant protection. The Chrysler Group made a daring decision when its Caravan and Town & Country minivans were due for a redesign: It invested its limited funds in a new platform that would accommodate a game-changing new seating feature called Stow ‘N Go. 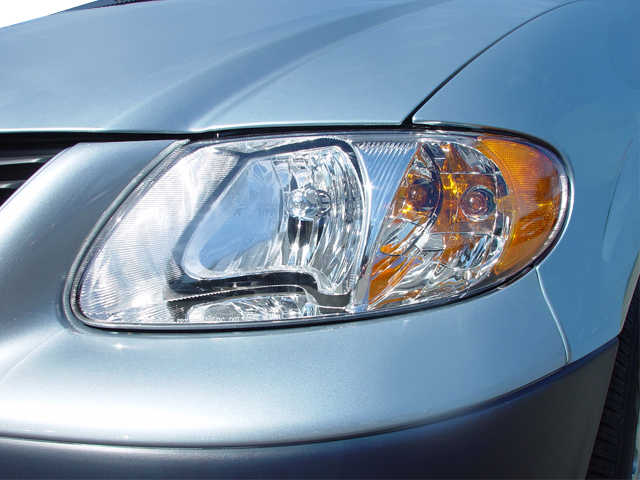 This meant that much of the vehicle that’s seen by consumers would remain little changed from when this iteration was introduced in 1996. They say familiarity breeds contempt, but robust sales have proven this strategy to be sound. A key to pulling it off is that both the short-wheelbase Caravan and the long-wheelbase Grand Caravan are nicely proportioned and cleanly detailed. An attractive monochromatic paint job is standard on all but the base Caravan SE, and top-trim SXT models get handsome 16-inch alloy wheels. 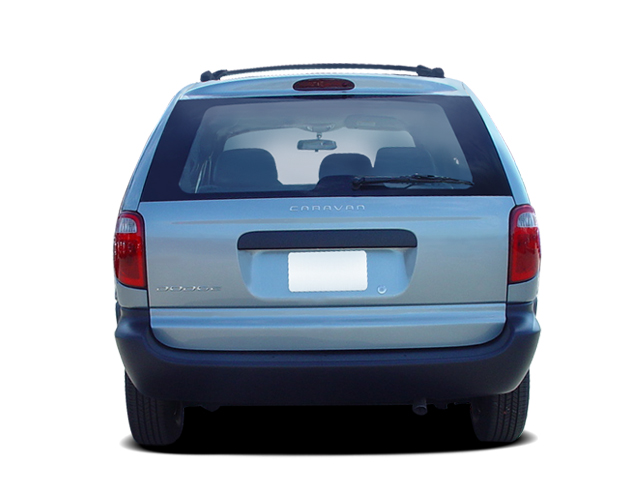 Both the Caravan and Grand Caravan feature three rows of seats that comfortably accommodate a maximum of seven passengers. Finding room for those passengers’ luggage, however, is a different story: The standard Caravan has very little cargo space behind the third row, so it isn’t the best choice for long road trips with the whole brood. 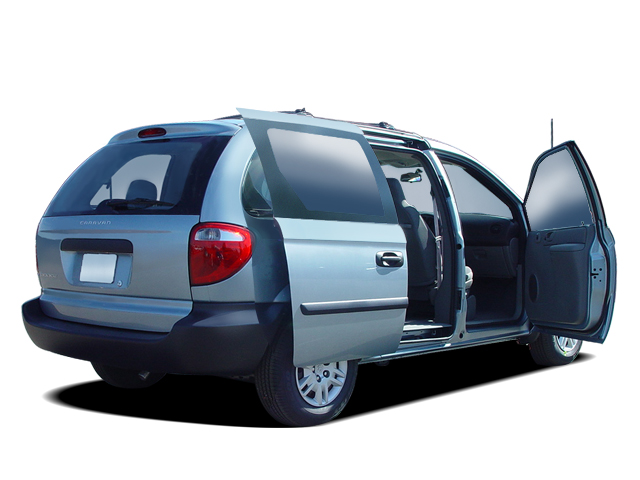 The Grand Caravan, however, carries all of its extra length behind the third-row seats, so it can handily consume a week’s worth of luggage for seven. 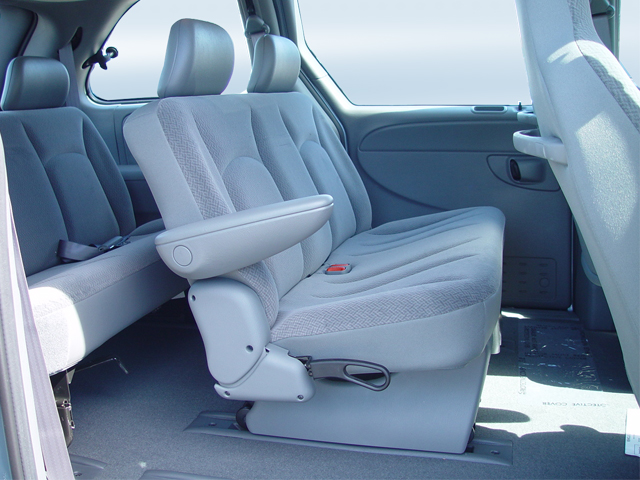 Moreover, the Grand Caravan offers the Stow ‘N Go seating system, which can transform the interior from a seven-passenger people-hauler to a two-passenger cargo-hauler with a completely flat load floor. Standard on SE Plus and SXT models, Stow ‘N Go features a pair of second-row captain’s chairs and a 60/40-split third-row bench that tumble forward and backward, respectively, into lidded wells under the floor–no more wrestling with removable seats. 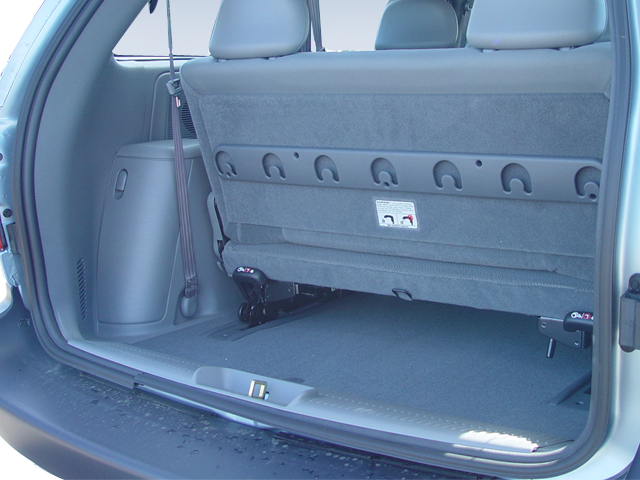 With second- and third-row seats in the upright position, these under-floor wells augment the Grand Caravan’s storage space by a significant 12 cubic feet–the size of a compact-car trunk. And if that’s not enough space, the Grand Caravan also can be had with a clever overhead rail system consisting of a trio of movable (and removable) hanging bins for small odds and ends. 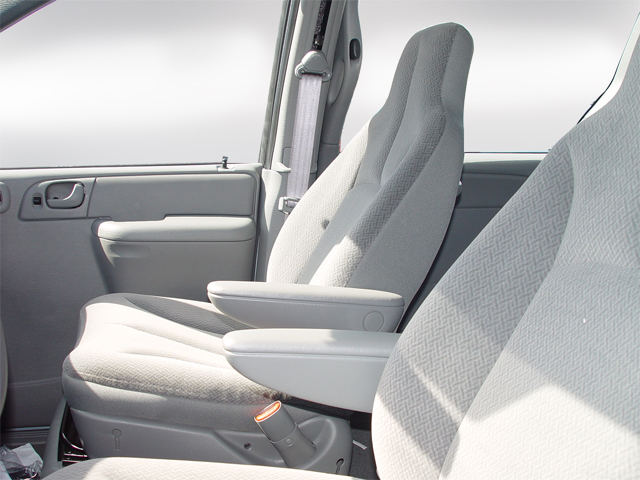 The seats themselves are notable for their use of a NASA-developed super-high-density foam for comfort and packaging efficiency. However, astronauts may be more tolerant than we are, as we found the second-row seats too small and soft for sustained comfort. The second-row seats slide fore and aft, and their seatbacks recline up to 40 degrees. 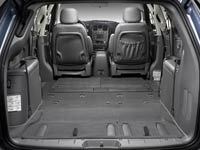 All in all, the Grand Caravan offers some 250 possible seating configurations. 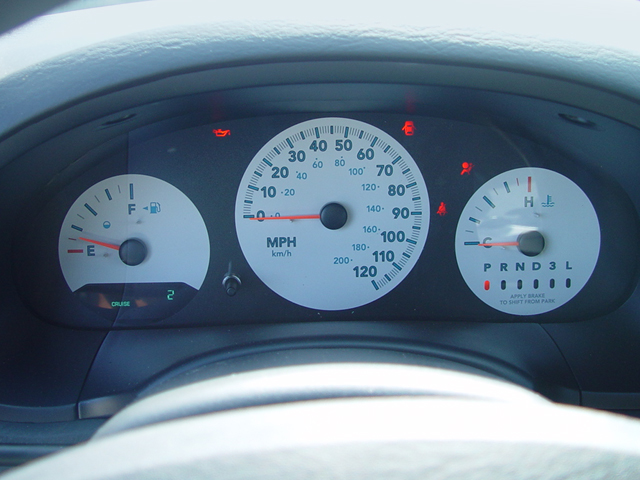 From the driver’s seat, it’s tough to fault the Caravans’ user-friendly dashboard layout; gauges are bright and legible, and controls are intelligently arrayed. 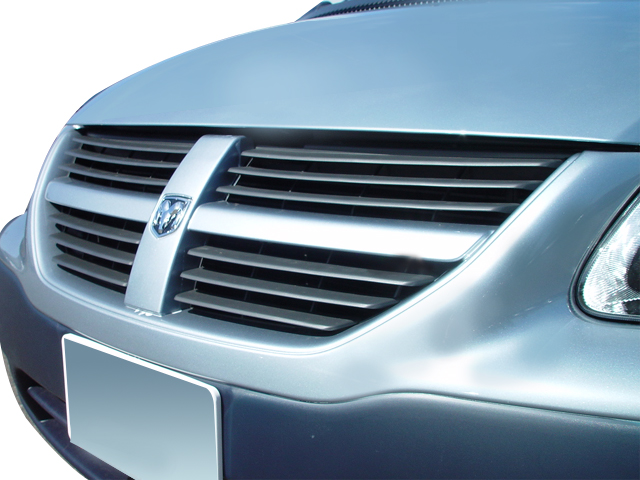 Interior plastics, although too often of the hard-and-shiny variety, are certainly durable, and fit and finish are quite satisfactory, but not quite up to the level of some of the Caravan’s rivals, notably Honda and Toyota. In addition to having an admirably crashworthy structure, the Caravan and Grand Caravan boast standard multi-stage front airbags and a driver’s-side inflatable knee-blocker. 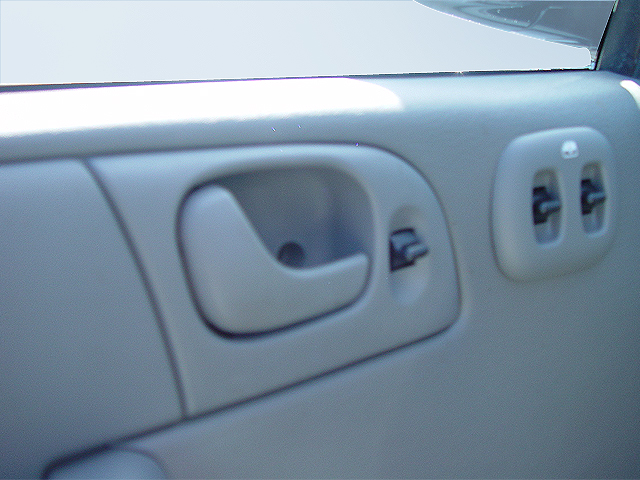 Full-length side-curtain airbags are available. All outboard passengers get three-point seatbelts, and front-seat occupants get seatbelt pretensioners. 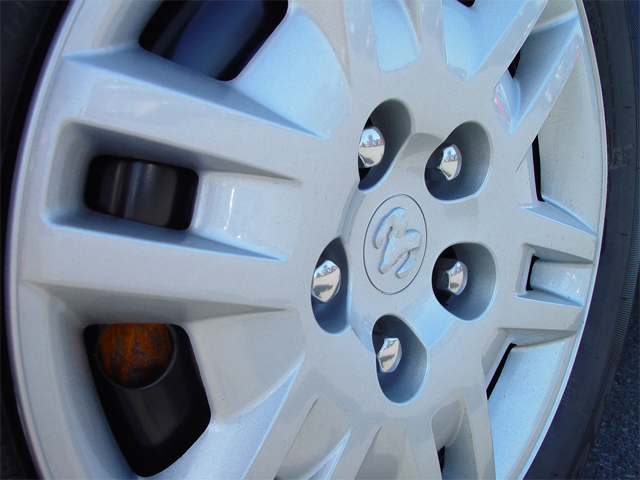 An anti-lock braking system is standard equipment on all Grand Caravan models, but is still an extra-cost option on the Caravan SXT–and not available at all on the four-cylinder Caravan SE (all the more reason to avoid it). All models feature an alert that notifies the driver when the sliding side doors (either manual or optional power-operated) are in motion. Electronic stability control is starkly absent from the list of options. 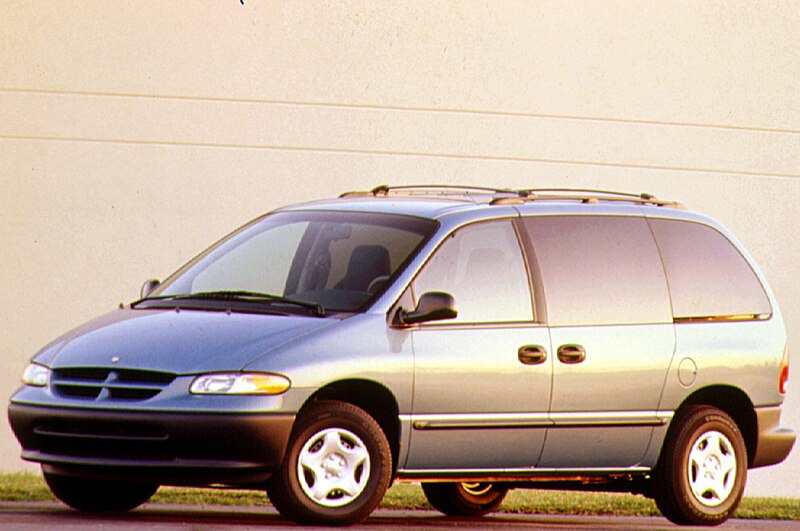 Since the demise of the value-leading Chrysler (ne Plymouth) Voyager, the base Caravan SE has assumed the role as the Chrysler Group’s entry-level minivan. 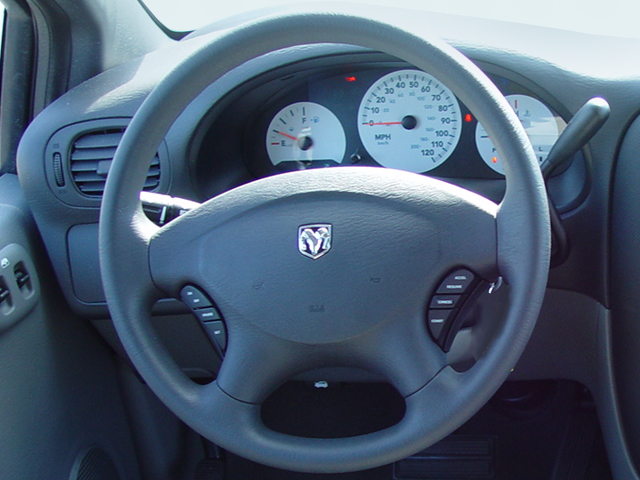 As such, it features a 2.4-liter DOHC inline four-cylinder engine (also the base powerplant in Dodge‘s Stratus). Woefully unsuited for minivan duty, the overworked four meets a four-speed automatic transmission and coughs out 150 horsepower and 165 lb-ft of torque. Adding insult to injury, it returns just 20 mpg in town and 26 on the highway, only marginally better than the optional V-6. That engine, an overhead-valve unit displacing 3.3 liters, motivates the uplevel Caravan SXT and the Grand Caravan SE and SE Plus. Also matched to a four-speed automatic, the 3.3 is a cast-iron antique next to the state-of-the-art multi-valve sixes in several of the Caravan’s Japanese rivals. Nonetheless, Dodge’s six-cylinder workhorse is reasonably quiet, reasonably willing, and undeniably easy to live with, producing 180 horsepower and 210 lb-ft of torque and returning 19-city/26-highway mpg. 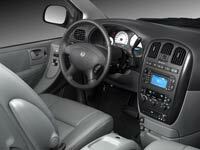 The top-trim Grand Caravan SXT upgrades to a somewhat larger, but no more sophisticated, 3.8-liter OHV V-6. Through its four-speed automatic, the 3.8 delivers 207 horsepower and 238 lb-ft of torque–adequate, but significantly short of the standard sixes in such prime rivals as the (230 hp), (240 hp), and (255 hp). It’s worth noting that all Caravans and Grand Caravans are front-wheel-driven; the all-wheel-drive option disappeared with last year’s wave of revisions to make room under the floor for Stow ‘N Go. 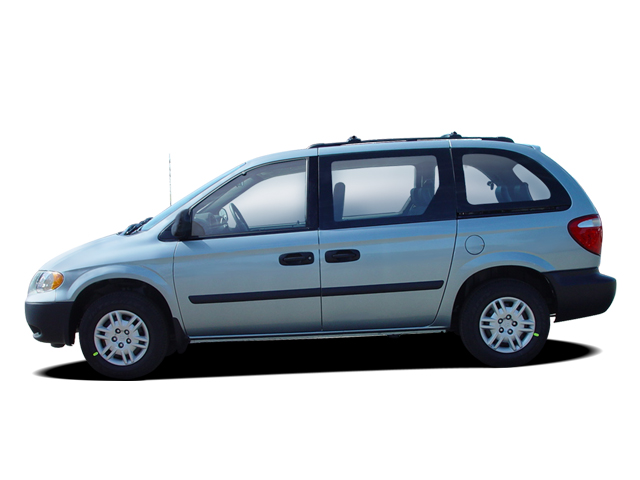 Although hardly the standard-bearers of the class, both the Caravan and Grand Caravan, among minivans, are thoroughly effective on the road. 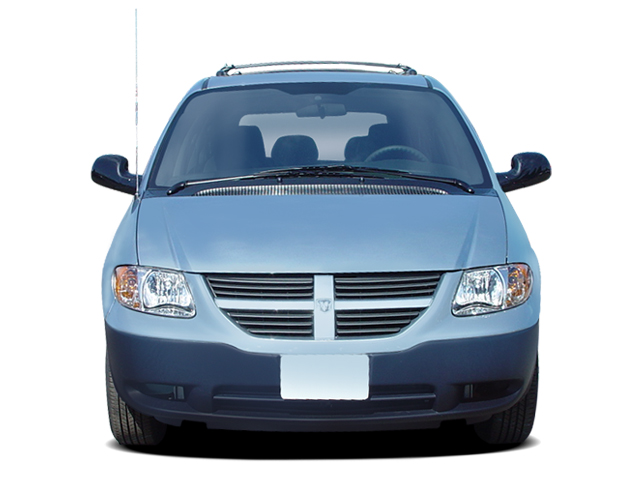 At highway speeds, they’re both quiet and composed, though the longer, heavier Grand Caravan has the edge in straight-line stability. Steering is accurate, albeit typically overboosted, and body control, while hardly sporty, is at least predictable. 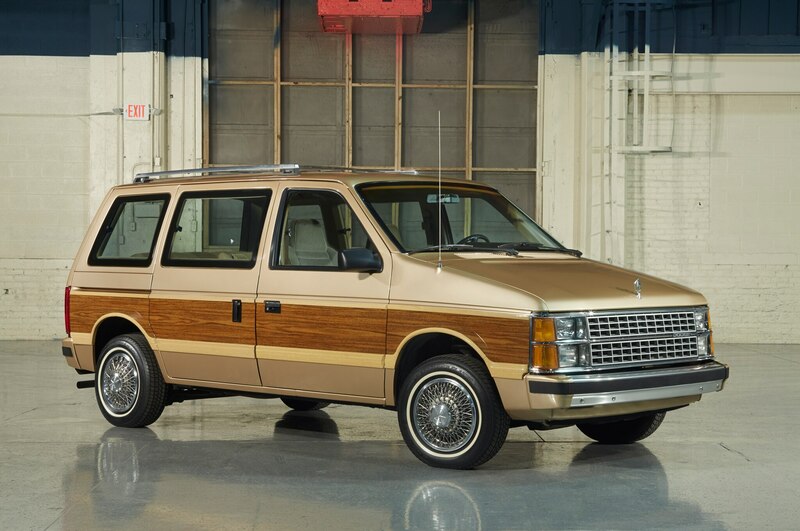 The vans’ around-town maneuverability pleasantly masks their considerable bulk, and the four-speed automatic’s short gearing affords a degree of off-the-line alertness that belies the V-6 engines’ general gutlessness. 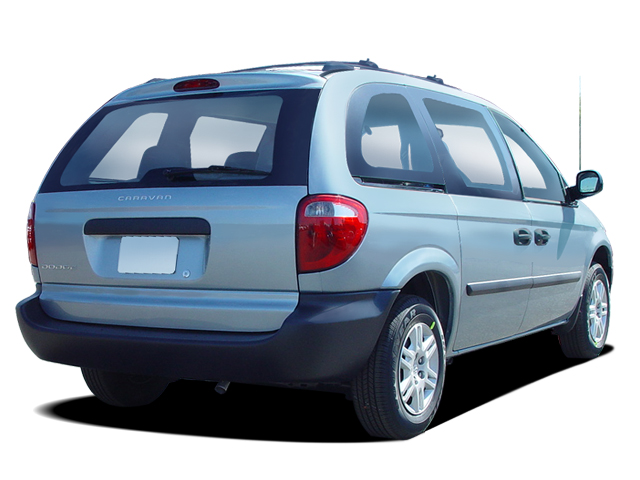 The Caravan starts well under $20,000 and the Grand Caravan at less than $24,000. For such relatively modest cash, Dodge’s duo is surprisingly well appointed. Standard equipment includes air conditioning, a four-speaker AM/FM/CD stereo, and a lockable storage bin under the front-passenger seat. All Caravans are protected by Dodge’s generous warranty coverage, including three-year/36,000-mile bumper-to-bumper and seven-year/70,000-mile powertrain. The Caravans’ massively reconfigurable passenger compartments and raft of innovative features help them standout in the crowded segment. While the IntelliChoice Ownership Cost Value Rating may be Average, there are often factory and dealer incentives to sweeten the deal, ensuring that the minivan that started it all still has what it takes to hold its own in this fiercely competitive segment of the market. 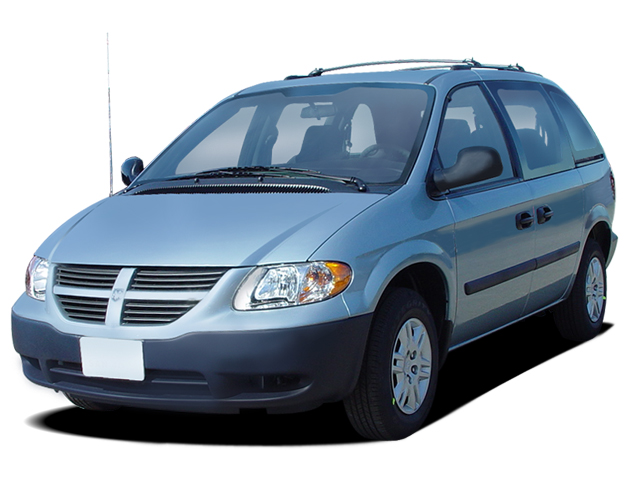 The Caravan and Grand Caravan continue to hone the minivan formula they created over two decades ago, offering comfortable, safe family transport with innovations to enhance the journey and adapt to daily transportation needs. 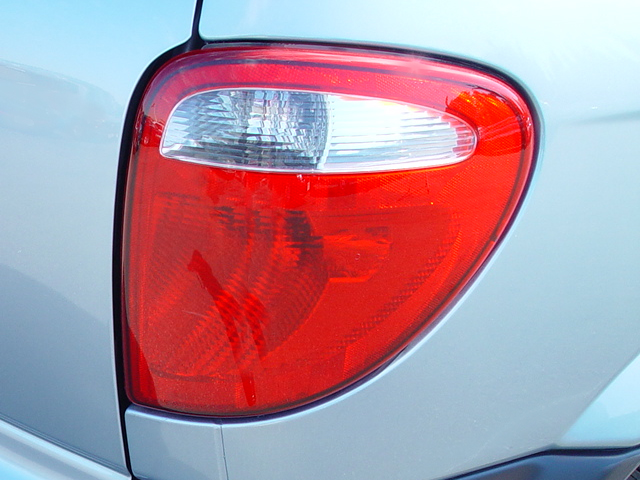 Thoroughly revised for the 2005 model year, the Caravan and Grand Caravan enter 2006 with no substantial alterations. 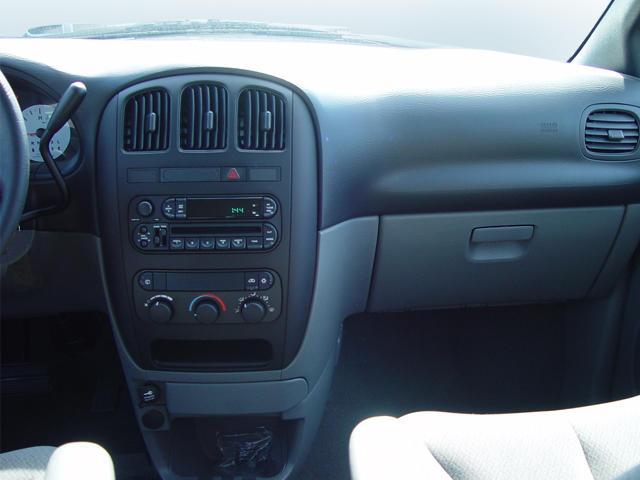 Depending on model and trim level, Caravan and Grand Caravan buyers can opt for such creature comforts as an eight-way power driver’s seat, power-adjustable pedals, subscription-based Sirius satellite radio, and the innovative UConnect hands-free communication system, which features wireless integration with Bluetooth-enabled cell phones. A rear-seat DVD entertainment system with a seven-inch fold-down display also is available. 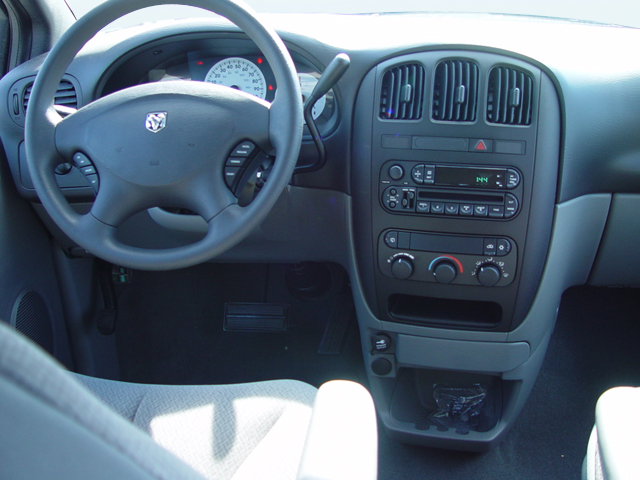 And one particularly worthwhile option on the Grand Caravan SXT is the excellent DVD-based GPS navigation system, which uses a small but easy-to-read full-color display on the radio faceplate. NA / 142 cu. ft.